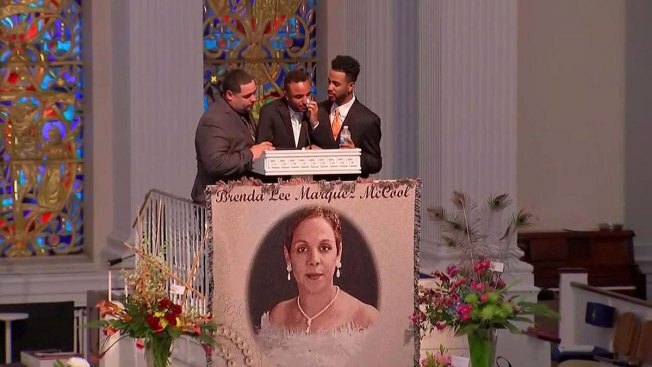 Isaiah Henderson, supported by two of his brothers, during his eulogy Monday for his mother, Brenda McCool, at First United Methodist Church in Orlando, Florida. Brenda Lee Marquez McCool, mother of 11 children, was laid to rest Monday after she was fatally shot during the Pulse nightclub rampage last week. McCool, 49, was dancing with her son Isaiah Henderson, 21, when gunman Omar Mateen opened fire inside the club. McCool survived cancer twice and died saving her son, according to witnesses who said she pushed him out of harm's way when the shooting started. Henderson said in his eulogy that his mother was "crazy," but in a good way, and "she literally loved everyone," NBC News reported. He needed the support of two of his six brothers as he broke down in tears at the funeral at First United Methodist Church of Orlando.